Visible from much of Corona towards the west is an old winding fire road on the Santa Ana Mountains called Skyline Drive. 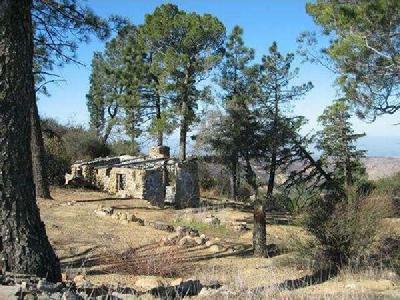 Often closed to the public because of the fire danger to the Cleveland National Forest, few residents ever discover what it is, and even fewer have ventured the four-mile hike, mountain bike ride, or bumpy drive to the top. If you ever are able to make the trip, you will be rewarded in several aspects. The first is the view. The main cabin was built in 1930, and the smaller one shortly thereafter. They were one room each. The smaller one was built for a caretaker. Although the family only used it on weekends, sometimes a caretaker would live there for up to a few months at a time. All the coniferous trees were planted by the family. A system of cisterns can be seen around the area for water storage which made it possible to grow the trees. One cistern a little ways down from the main cabin was used as a swimming pool. Due to constant vandalism and theft when a caretaker wasn't present, it eventually became impossible to maintain. At the top of Black Star Canyon, which got its name from coal mining, you can see the Santa Ana Valley to the west, the Orange County coastline, and on very clear days, even Catalina Island. Northeast is the entire inland basin. To the east are the magestic San Gorgonio and San Jacinto mountains. Then there are the enormous and ugly, and enormously ugly, microwave repeaters and doppler towers. Don't look at those. Far more interesting are the long defunct KART-AM radio station, abandoned forestry guard shack, and WWII lookout tower. But, what is really going to catch your eye, and imagination, is Beek's Place. 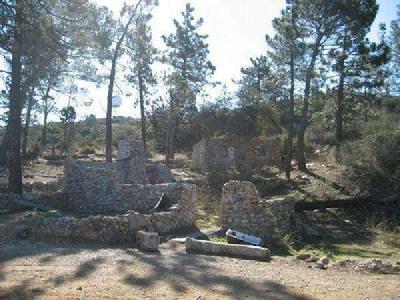 These ruins at 3047 feet are what's left of the family weekend getaway home of a Mr. Joseph A. Beek. Just who was Joe Beeks? While still a student at Pasadena City College, he became a real estate salesman and then served as the Newport Harbor Master for a short time. In 1919, he obtained a franchise for a ferry service to Balboa Island. In 1920, he sailed the first auto across the bay for 10 cents. By 1922, Joe got a ferry boat which held two cars. He played a crucial role in the development of Balboa Island, and spent a lifetime devoted to it. He even served as Secretary of the California State Senate for a few years until his death in 1968. The Balboa Island Ferry is still run by his family to this day with three 64-foot boats that can carry three cars each. Okay, so this artifact is not in the museum, not really even in Corona, but it has been a curious part of Corona for almost 80 years. Through the front windows of Beek's Place, which are actually just inside the OC boundry, all of Corona is laid out before you. You can easily stare back with a pair of binoculars, if you know where to look.